Here's a really fun place to shop, no matter what the time of year, the occasion, or the recipient of your gift-shopping. NOVICA is a place where you can find gifts that really are one-of-a-kind, unique pieces of art. And when I say art, I don't mean just paintings, sculptures and other items typically associated with art-although these are available. However, every item on the Novica website is literally a work of art, whether it's one of their beautiful christmas ornaments, a women's blouse, or one of their unique home decor pieces. For our Fall Festival, I thought it would be fun to showcase some of the lovely clothing and accessories available through Novica, that would be perfect for a stylish autumn wardrobe. 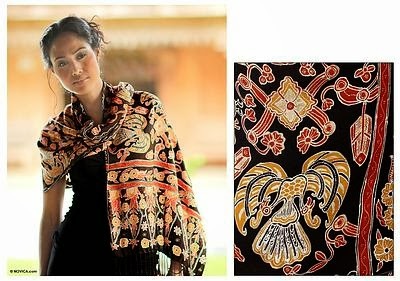 First, I just love these women's shawls. 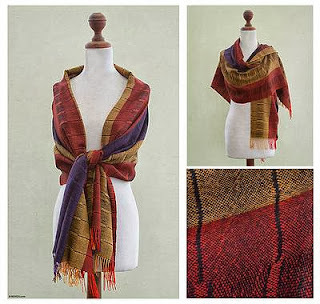 The colors are very fall-ish, and would add an exquisite touch of style to any autumn look. And with over 500 shawls to choose from, if neither of the shawls pictured below fit your style, they are sure to have one (or more) that will! 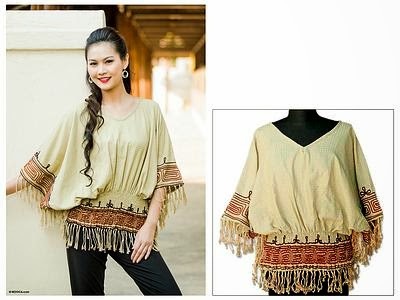 I also love the beautiful tops you can find on Novica. Recently I've started wearing the tunic-style tops, as they are so comfortable! 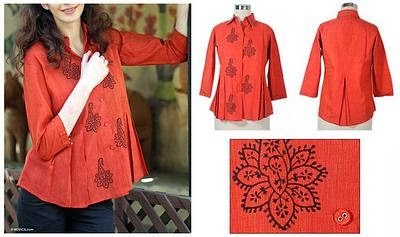 You can find several tunics in fall colors on Novica, as well as other feminine tops. As a last addition to your fall wardrobe, be sure to check out the lovely sweaters as well. The weather is starting to turn chilly here, so I will be pulling out my sweaters this week-and maybe shopping for a new one?! Novica is giving one of my readers a $25.00 Novica Gift Code!! The preserved flower necklaces -- lovely! i love the mango wood vases from thailand! I really want one of their alpaca wool sweaters! I like the beaded cotton tunic, Turquoise in Delhi. Love the Prayer Box square locket silver and I love all the items you chose as well! I like the Alpaca blend gloves, 'Gray Clouds' by Sebastian Alayna Condere. Follow you on Pinterest (Elena Shkinder-Gugel). I love the Loyal FrangipaniHandmade Sterling Silver Flower Earrings. I like the Love Butterfly Necklace. This a virtually impossible task for someone like meo wh currently has over 615 items on her (my) Novica Wish List! It would really depend on what I was shopping for! When I'm looking for Jewelry and Accessories - many of my favorite designers/artisans are in/from Thailand: like Nareerat, Danai, Sasina, Busarin and so many others. I also have many favorite wood sculptures/statuettes from artist in Bali/Java, Thailand and all over the world. I like the Footprint of Buddha Thai Acrylic Painting! 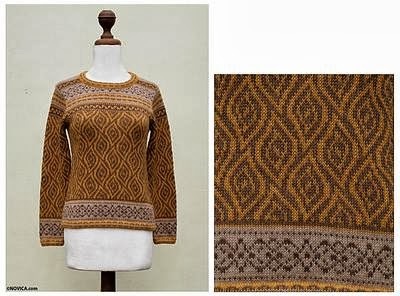 Alpaca Wool Art Knit Pullover Sweater from Peru today! It is gorgeous!